In the subcompact market, you can get good value under $20,000. Kia has redesigned the Rio sedan and hatch models giving it even more appeal among subcompacts. Outside, it has an all-new look that is grown-up and stylish. On the inside, the Rio is well-assembled and is relatively spacious considering its size. Urban dwellers will want to look at the new Rio for its affordability, fuel-efficiency and appealing character. This week we give a review the top-of-the-line 2018 Kia Rio EX Sedan that still comes in under $20K. The Kia Rio has been completely redesigned for 2018. The new Rio is uncomplicated yet cosmopolitan at the same time. 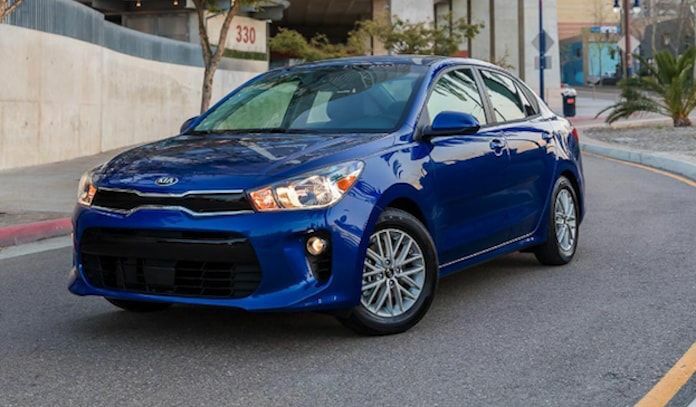 The 2018 Kia Rio top trim EX sedan ($18,400) comes standard with keyless entry, heated power mirrors, map lights, a sliding center console armrest and storage area, a 60/40-split folding rear seat, an extra USB port (charging only), a rearview camera, Bluetooth connectivity and a six-speaker audio system. The top-of-the-line EX also features 15-inch alloy wheels, a chrome grille surround, fog lights, a tilt-and-telescoping steering wheel, a leather-wrapped steering wheel and shift knob, a forward collision warning system with automatic braking, upgraded cloth upholstery, dual illuminated vanity mirrors and an upgraded 7-inch center display with Kia's Uvo infotainment system (which includes Apple CarPlay and Android Auto). Total MSRP including destination: $19,425. 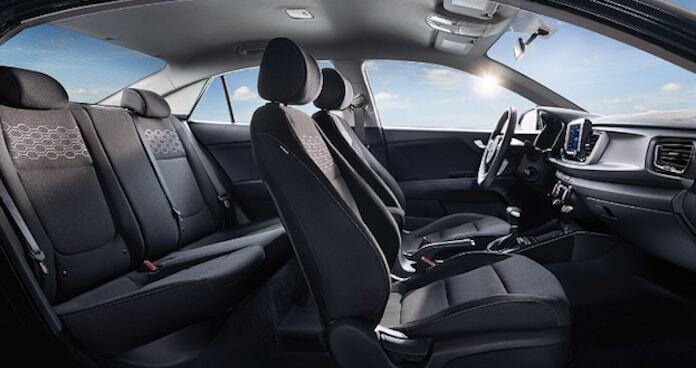 The interior of the newly-redesigned Rio is simple yet sophisticated. There’s still plenty of hard plastics throughout the cabin, but what do you want for under $20K? Kia has done a good job of building a solid subcompact sedan interior. It gets a redesigned dash and gauge cluster we thought feels more upscale than most of the competition. And there’s plenty out there from the Chevy Sonic, Honda Fit, Ford Fiesta, Nissan Versa Note and Hyundai Accent. Even though the new Rio is budget-priced, it doesn't feel cheap. The top trim EX presents itself well with a multi-adjustable driver’s seat, upgraded cloth interior, and tilt/telescoping steering wheel allowing easy adjustment to find the perfect driving position. The top trim EX offers some key features like the upgraded 7-inch touchscreen and rear camera, along with Kia's user-friendly Uvo infotainment system, that make the upgrade worthwhile. In the back, Rio offers up sufficient room for adults for shorter rides, and kids will feel comfortable if you need to haul three in the back seat. Rear seats split 60/40 and fold down for extra cargo carrying ability. The sedan comes with 13.7 cubic feet of cargo room in the trunk. These are average figures for the class, though the redesigned suspension allows for a wider load floor. Kia Rio EX is powered by a revamped version of Kia's 1.6-liter four-cylinder engine. It offers slightly less power compared to the outgoing model (130 horsepower versus last year's 138), but Kia says it decided to trade peak power for more usable power. That translates to stronger power at lower engine speeds which Rio drivers encounter most often in city doing and traffic. It comes mated to a six-speed automatic transmission driving the front wheels. Fuel mileage estimates come in at an EPA/DOT estimated 28/37 city/highway mpg and 32 combined mpg. Rio gets a retuned suspension and extra frame strength and we thought the new sedan felt more stable at highway speeds. We drove the Rio at higher elevations west of Denver and never felt we needed more power. We pushed it hard around some tight mountain corners, and the small sedan is nimble and felt relatively sporty in the curves. In the city is where the Rio shines. It’s a capable urban commuter with the ability to navigate narrow city streets, and allows for easy parallel parking and squeezing into smaller parking lot spots. We appreciated the forward collision warning and auto-emergency braking in slow stop-and-go city traffic. Visibility is good for a subcompact and rear camera gives an extra set of eyes when backing up. On the highway, the firmer suspension can be a bit harsh over unbroken pavement, but feels more planted and gives the driver a feeling of confidence when traveling right next to big SUVs. The 6-speed automatic transmission has gears nicely spaced to deliver peak performance, never hunting for the right gear, and we liked it much more than typical CVT automatics found on many subcompacts these days. Overall, the new Kia Rio remodel offers up an affordable, fuel-efficient, appealing urban commuter. It’s among the most affordable subcompacts today. The top trim Rio EX is appealing for its multitude of standard features, Uvo infotainment system, safety aids, excellent warranty and it still comes in under $20,000. For maximum use of space, small (or all) sedans should be hatchbacks. My last two "sedans" were hatchbacks. Can't think of a meaningful advantage of a sedan over a hatchback. The Kia Rio does come in a 5-door hatch Mark. Hopefully we'll get to review it soon. Thanks for reading! Thanks for the info... A comparison of the hatchback vs sedan would be interesting. I would prefer the hatchback as well for compact size cars. Great job Kia, this is a nice cheaper alternative.